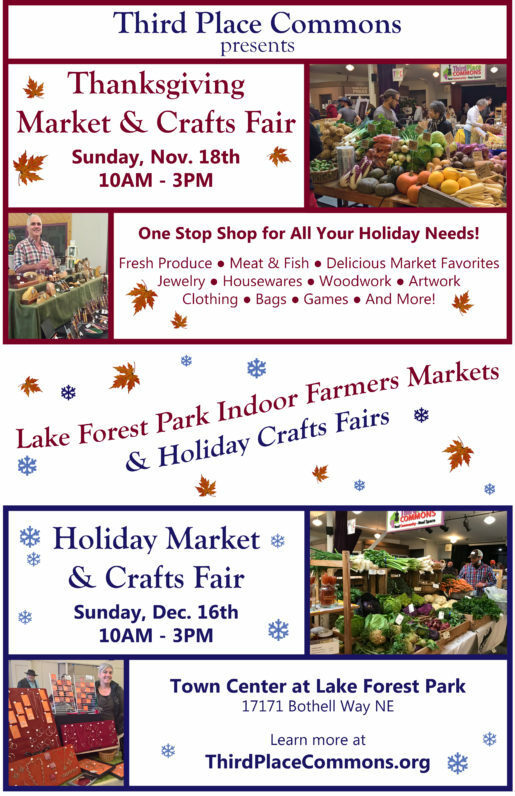 This Sunday is the perfect time to start preparing for your Thanksgiving feast and to get a jumpstart on your holiday shopping thanks to the return of the Lake Forest Park Farmers Market and Holiday Crafts Fair! Start making your Thanksgiving dinner shopping list now so that you’re ready to receive the full bounty of the LFP Farmers Market this Sunday from 10 AM to 3 PM. Pick-up all the freshest and best in Washington grown and produced fruits, vegetables, meats, fish, wines, baked goods, and more. Farm-fresh offerings – including apples, artichokes, arugula, beets, broccoli, Brussels sprouts, garlic, pears, potatoes, pumpkins, sweet potatoes, winter squash, zucchini, and so much more – will help you top your table in delicious style. Both events take place at the Town Center of Lake Forest Park. The LFP Fall Farmers Market will be upstairs at Third Place Commons, while you will find the Holiday Crafts Fair in the lower lobby. Both will be open from 10 AM to 3 PM. And don’t forget to mark your calendars for the final fall market and holiday crafts fair on Sunday, December 16th (details to come)! The LFP Farmers Market and Holiday Craft Fairs are presented by Third Place Commons, a community-supported 501(c)3 nonprofit organization dedicated to fostering real community in real space. Third Place Commons is located in the Town Center at Lake Forest Park at 17171 Bothell Way NE, Lake Forest Park, Washington 98155. Previous Post: Trick-or-Treating & Free Magic Show Wednesday at the Commons!